Today I have another tasty review and giveaway for y'all. If you're looking for a festive holiday cookbook packed full of Christmas recipes, then Hometown Christmas is for you. This beautiful homespun cookbook has everything you need to get you through the holiday baking season. Christmas is my favorite time of year especially for cooking and baking. Christmas is the time of year when I think back to when I was a little girl and all the holiday recipes my mom made every year. 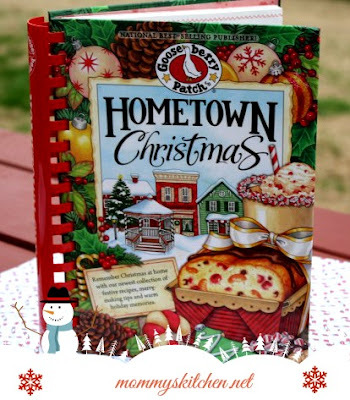 Hometown Christmas is packed with over 200 scrumptious recipes and heart warming memories of Christmas at H♥ME. Grab a mug of cider or hot chocolate and curl up and enjoy 7 delicious chapters of this festive cookbook! You can also visit the Gooseberry Patch You Tube Channel and see 7 Hometown Christmas recipes prepared by Vickie and Jo Ann themselves. I can't wait to try the Hearty Pizza Soup and the Scalloped Potatoes & Ham. 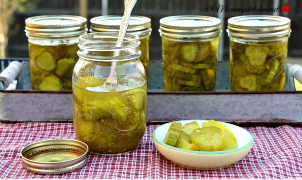 Gooseberry Patch also has a Pinterest board with more wonderful recipes from Hometown Christmas. 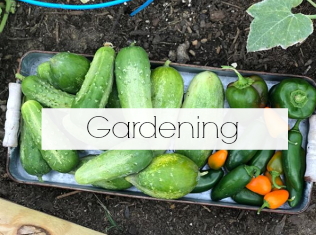 Click the Pinterest link above and follow along. 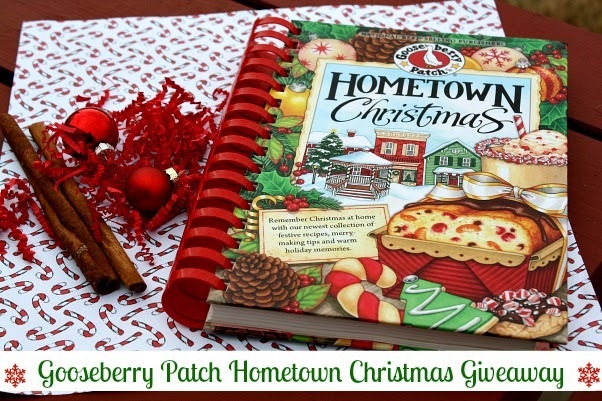 Now it's time for me to share the recipes that I tried from Hometown Christmas. 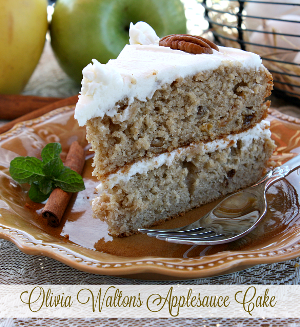 The first recipe was for this delicious Apple Coffee Cake from Chapter One. 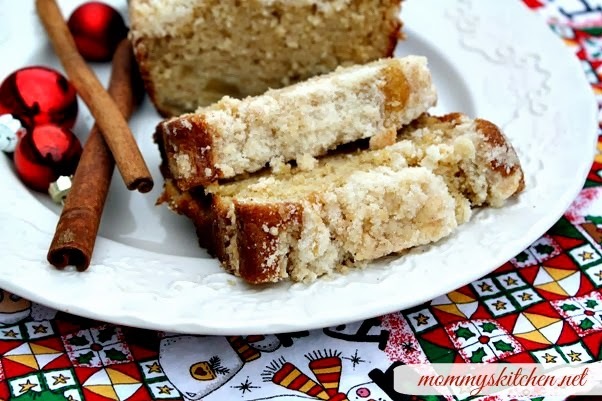 This recipe comes from Robin Horst in Virginia Beach, VA.
Robin says that her Grandma Helen made this coffee cake every year when she came to visit. 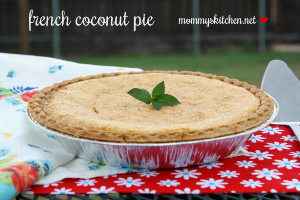 You can use apple, pineapple or even peach pie filling. I found that this coffee cake taste even better the second day around. Preheat oven to 35o degrees. In a bowl combine dry cake mix, eggs, vanilla and pie filling: mix well. Pour batter into two 9x5 inch loaf pans sprayed with non stick spray. Set aside. In a separate bowl, combine the flour, sugar and butter. Blend with a pastry blender until the mixture resembles crumbs. Sprinkle the crumb mixture evenly over the top of the batter. Bake at 350 degrees for 35 - 40 minutes or until a toothpick inserted comes out clean. cool; remove from pans. Keep well wrapped. Recipe yields: 2 loaves. The recipe states to bake the coffee cake in two 9x5 inch loaf pans. 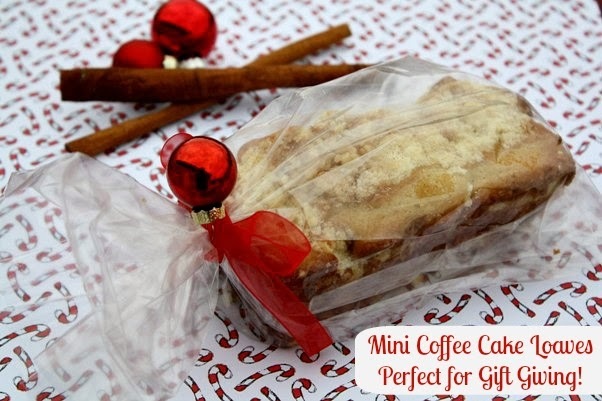 I use one large loaf pan and used the remaining batter to make mini coffee cake loaves for gift giving. Just wrap in clear sacks and attach a ribbon and a gift tag. I also added a mini ornament to add a festive touch. 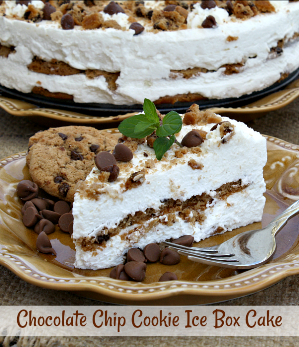 This coffee cake freezes very well. 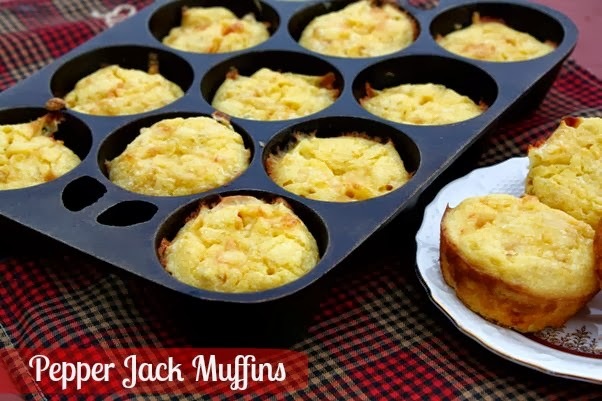 Second on the list was these yummy Pepper Jack Corn Muffins pictured above. A pan full of these warm muffins pairs wonderfully with your favorite chili or taco soup. I baked my muffins in my cast iron popover pan, because besides popovers it also makes wonderful cornbread muffins. This recipe was submitted by Vickie herself. Preheat oven to 400 degrees. In a large bowl, combine cornmeal, salt and baking soda: set aside In a small bowl, whisk together eggs, sour cream, oil, creamed corn and 1/2 cup cheese; add to the cornmeal mixture. Stir with fork just until moistened. Spoon batter into greased muffin cups filling 2/3 full. Top with remaining cheese. Bake at 400 degrees for 25 minutes until golden brown. Recipe yields 12 muffins. I couldn't imagine the holiday season without a Gooseberry Patch Holiday Cookbook in my kitchen. Not only do they have fabulous recipes, but their cookbooks also include so many affordable craft and gift ideas sprinkled throughout the cookbook. 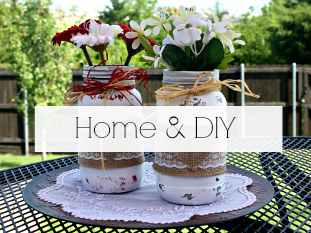 I have so many simple ideas saved that I can't wait to try. Gooseberry Patch, Amazon, Walmart, Cracker Barrel and various other retailers. In addition to providing me with a cookbook to preview, Gooseberry Patch also gave me a second copy to use in a giveaway to one lucky Mommy's Kitchen Reader. Contest is open to US & Canadian Residents only due to shipping charges. I will choose one random winner using random.org. If you post a anonymous comment please leave your email address in your comment, so I can contact you in the event that you're the winner. Contest begins today 12-22-13 and ends of 12-31-13. I will contact the winner by email. Winner will have 48 hours to reply or a new winner will be chosen. Good Luck! Disclosure: This is a sponsored post on behalf of Gooseberry Patch. I was provided with a copy of Hometown Christmas for purpose of this review as well as a second copy to use in a reader giveaway. All opinions stated above are 100% entirely my own. Definitely ginger crinkle cookies. We make 2-3 batches every year! Coconut cake and Ding Bat cookies are favorites that bring back all the memories of home at Christmas! It would have to be cut out sugar cookies, because my Mom and I used to make tons of them every single year. Mom always made sure the local children's home had cookies and also a nearby nursing home so we decorated them and took them to both places. I always remember her when I make them myself. I´m mexican and the "buñuelos de molde" are my favorite. The buñuelos are a recipe made with flour, milk and eggs. You must to have a "molde" to deep in the mixture and fried in a very hot oil. After a seconds, sprinkle with sugar and cinnamon. We share with the family and friends and enjoy with "atole blanco" mmm... all the flavor and love in Chritsmas! I don't a Christmas recipe but my favorite recipe is my grandmothers spaghetti sauce. I'm making spaghetti and meatballs for Christmas Eve and then she's making lasagna for Christmas. We eat it through out the year but it so much more at the holidays surrounded by family. Mexican Wedding cookies are the cookies I baked for the first Christmas I was married, 37 years ago. And still today they remain my favorite. I love Cinnamon Rolls , I make them every Christmas. Thanks for the chance. Sausage balls!!!! We always eat sausage balls Christmas morning as we open presents. The Gooseberry Patch Cookbooks are wonderful. They have the best recipes. 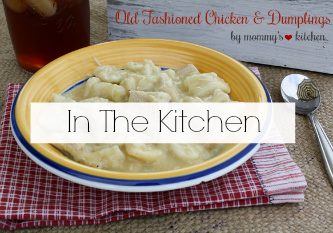 A favorite Christmas recipe that reminds me of home? Homestyle Cornbread Pudding. It was one of the best dishes my Grandma had ever made and I still have yet to find anyone who makes it as well as she did. Banana Pudding was my dad's favorite so my mom would make it often. My Mama's dressing, so good. Christmas Sandwich Cremes! Its a buttercream filled wafer cookie and its so good. Mom's scratch homemade blackberry jam cake with brown sugar icing. my grandmother made each year. She always made it with fresh grated coconut. My Mom always made Sandies cookies. Banana bread ! This was a yearly treat that family and friends looked forward to every Christmas. Us kids always got to help with smushing the bannas with our hands. My mom always said that using hands instead of a tool made the bread taste so much better. Homemade peanutbrittle, sugar cookies, bon bons. My favorite recipe is my grandmas homemade peanut butter fudge. It wouldn't be Christmas without it. Believe it or not, Fruitcake! My aunt used to make fruitcake every year when I was a child. She would start in July. It was wonderful! My kids love baking sugar cookies for Christmas. I have been making the egg nog cookies ever since you first posted the recipe. They are now a staple at Christmas! 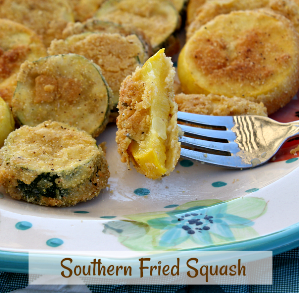 THANK YOU FOR YOUR RECIPES , EVERYTHING SOUNDS WONDERFUL AND I WOULD LOVE TO WIN THE COOKBOOK . My favorite is banana bread...it's a must have ! I made your Toffee Candy or "Christmas Crack" yesterday for the first time! OMG it was soo good! I will be making it every Christmas from now on,that's for sure! Thank you for all the wonderful recipes! I'd love to win because my husband will return from Afghanistan soon and I'll need all the help I can get! Iced cut out cookies !! YUMMY!! My favorite Christmas recipe is our family Greek Christmas cookies -- the best in all the world!! My mom's chocolate chip-date-pecan cake!!! Peanut butter balls and sausage balls make it feel like home. Divinity, my daughter and I make. It gives us time to be together. The recipe that reminds me of Christmas at home is roll out cookies with icing. Mother made them every year and I carry on the tradition now. Mincemeat pie. My grandmother made her's with deer meat. It was the best! Reminds me of childhood Christmas dinners with family! My favorite is sour cream roll out cookies with lots of frosting and colored sugars. My aunt's divinity, my dad's peanut brittle, fruit cake cookies and fruit cake. One of my favorite Christmas dishes is corn casserole! What says home to me is my moms hamburger soup. Or perhaps its my grandmother's oatmeal raisin cookies. It's so hard to choose. I love Gooseberry cookbooks! At Christmas, my Mom would always make a Date Roll. I make it now and think of her when I make it! Merry Christmas! One of my favorite reminders of Christmas was my mom's Jam Cake. She made it often from the berries we picked during the summer. Mom was special because she was in a wheel chair from polio she contracted just 2 months after her marriage. Everything she did was a struggle, yet she raised 2 children and worked hard on the family farm wearing her braces and using crutches. I think about her whenever I see a Jam cake recipe. I really would love to win this book I use some of the recipes from your other books all of the time. Last night I made Peanut Butter Brownies from one of your cookbooks and they turned out great. My husband ate most all of them. Jam Cake is my favorite for Christmas. 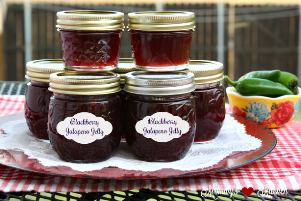 I remember my mom making this from the berries gathered during the summer. Mom was very special because just 2 month after her wedding she contracted polio. Everything she did from that time on was done from a wheel chair or with a huge leg brace and crutches. Life was hard for her living on a working farm. She did amazing raising 2 daughters. I still have the pan she used to bake the cake in. My favorite recipe that I have baked for the past twenty Christmas seasons is Fudge puddles,given to me by a dear friend.It just wouldn't be Christmas in my home without them. Its definitely the green cornflake wreaths with little cinnamons on them ! Chocolate dipped Peanut butter balls. I love them dipped in white chocolate hubby and kids like milk chocolate. Been making them since my grown kids were babies. Merry Christmas to you and your family - its the home made buckeyes and sugar cookies that mother and all her five girls made!!!! Grandma's Sugar Cream Pie! Complete with lard crust, whipping cream filling and mixed with my fingers to get all that love in there. Annual Christmas punch of 7-up and orange sherbet! Cut out sugar cookies, LOVE THEM! Good ole fashion sugar cookies. The decorating was the best. All the dishes were great she made, but she did make great fudge and desserts. She's been gone for awhile now. But, will never forget Christmas as a child. A tradition that my children hold me to each Christmas morning is Overnight Sticky Buns. I tried to fool them this year by telling them I had the ingredients for blueberry muffins to make on Christmas morning and they said that's not we always do. Sticky Buns it is then. My grandson( 8) who lives with me has been in the kitchen with me a lot while I am cooking & baking. He told me that he wants to be a good cook so I won't have to standing so much. I'm disabled & would love to sit in the kitchen & help him with new recipes in this cook book. I would love to see if he can cook & bake some of these recipes in this book. We certainly would put it to good use. I've been making a dish my grandmother made & everyone always asks for it. And It doesn't have to be a holiday If I'm asked to make it I would be happy to. My Grandma's scalloped corn it is so good & so easy to make. I love making any kind of Christmas cookies...especially sugar cookies..with my sons. It just makes it feel so Christmas-y and my boys just love making the cookies. Merry Christmas from fort Worth Texas! My favorite recipe that I share with everyone on Christmas is my grandmother's chocolate chip cookie recipe. Nothing special for some but means the world to me since Memie is in heaven! Peanut brittle. My Mom only makes it at Christmas. I love the Ham for Christmas. And I love my daughter's Pecan Pies. And this year I baked the Mexican Wedding Cookies. They are delish. Christmas I bake several treats to give away to needy families: the most popular are Rice Krispies in Christmas colors and shapes-2nd are the Pecan Meltaways aka Mexican Wedding Cookies. I love the warmth their smiles bring-no greater gift. Your cookbook would be a new adventure for all Merry Christmas all year! My favorite Christmas recipe is Three Corn Casserole. Mine is definitely fruit cake except I don't have the recipe my grandmother used so I've never been able to duplicate it but I'm always looking. Chocolate fudge, date balls, fruit cake cookies, and lady fingers! My mom made them every Christmas! My dad's Christmas Cookies. He would make his cut out cookies only between Thanksgiving and New Years, and he would make close to 100 dozen just for the family. I remember him either mixing or baking during the holiday. My cookies come close, but nothing can compare to dads. My granddad's homemade ice cream. I still make it every year. I remember my granddad and my uncles taking turns turning the crank on the old ice cream maker. Then one year someone finally got him an electric ice cream maker. To this day, it is by far my favorite recipe. It has been handed down for many generations. my moms pecan pie, and home made buns!!! It wouldn't seem like Christmas without peanut brittle! I love these books. I'd like to win one. I love all the gooseberry cookbooks,the recipes fit right in with my life style of cooking, love your website its great. Merry Christmas. I'm a NUT when it comes to CookBooks! LOVE LOVE LOVE them. When My kitchen got remodeled I had them build a section just for cookbooks. 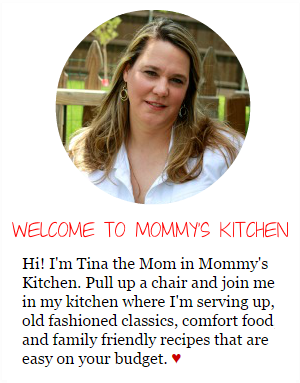 I love your blog and the fantastic recipes. I love to try them and share them. THANKS!! My mom used to have a buffet style dinner and we would have guests thru our door all day. Her prime rib was excellent! Big, huge, fluffy, homemade rolls! Love recipes, but get tired of printing them. 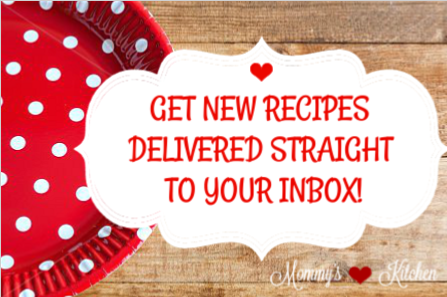 Looks like great recipes here! Each year I make my kids favorites & even now that they are grown, they still remind me to bring....Joey's favorite-Bacon-Cheese Wraps, Jenna's favorite--Deviled Eggs and anything baked is always a hit. I remember my Grandmother making Christmas fudge and divinity....I miss that. Favorite Christmas recipe - making raisin pie for my 89 year old father because his mother always had him one on Christmas! I would say it probably is Pumpkin roll and fudge. Traditional Cut Out Cookies and the fun of frosting them. It would have to be Christmas Sugar Cookies. I love making the shapes and then decorating them with the kids. To me nothing says Christmas quite like that. Chocolate pie reminds me of home. Mama beat the egg whites with a fork. I couldn't pick just one. 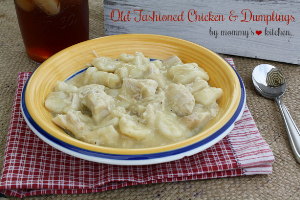 I remember banana pudding…macaroni salad, potato salad and the best ham I ever tasted. Still to this day we all get together on Christmas Eve and that is what we fix to eat before opening presents. Cut out sugar cookies and pistachio salad! Italian apple pie and soft sugar cookies. My mother's tea rings, she would decorate them with red and green cherries. My favorite recipe is my mom's sweet potato casserole. It is amazing. coretta shelton cmshelt48@yahoo.com my mommas cornbread dressing with jiblets. Being an older reader, my favorite thing mama made was 'Billy Goats'...they were an oatmeal bar cookie with powder sugar dusted on the top. That memory is so special. Homemade perogies are my favorite for Christmas. Also, we always had fish on Christmas Eve. This book looks amazing and I like that receipes here are simple without a lot of fancy ingredients. My turkey and stuffing.. Love this.. then best of all turkey sandwiches for the next few days..yummy..
On Christmas Eve my family & I always enjoy a 2 layered jello cake----one red layer and one green! Yum!!!!!! My grandmother's cornbread dressing was a favorite on holidays! The recipe that takes me back to childhood Christmas is a recipe called Nut Loaf. I had thought that this recipe was lost, but ran across it in time for Christmas this year. My mother passed away Oct. 2008. 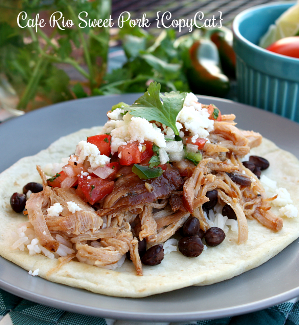 So when I came across this recipe of hers, I excitedly and quickly made this recipe. I shared it with my coworkers at our Christmas party. It was a hit and a joy to be able to share with them as well. My grandma made them every year at christmas and my dad continued to do so each year, and now I've started to do the same. It would have to be my Mom's Christmas ham! I don't know she does it, but I have never been able to do it the way she does! Butterscotch blondies! Thanks for the opportunity! My favorite is Mom's Gingerbread!! and the royal icing to go with....remember baking hugs batches of these every Holiday Season for years!! Moms Christmas sugar cookie recipe is my favorite holiday recipe. Homemade coconut cream cake and homemade fruit cake. My mom used to make the best cinnamon rolls. After sled riding we would come in and have those and hot chocolate. Some days I can still smell them baking.